Alfredo Corchadom will receive the Walker County Democrat Club’s Molly Ivins First Amendment Award in Huntsville Feb. 23 and give a free program Feb. 24 at Thoreau Woods Unitarian Universalist Church. 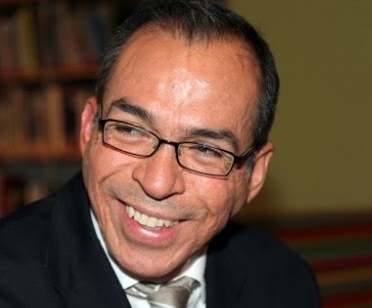 Alfredo Corchado, journalist and author, will receive prestigious award Feb. 23 and also speak at Thoreau Woods Unitarian Universalist Church free to the public Feb. 24. The Walker County Democrat Club will honor Mexican-American journalist Alfredo Corchado with its Molly Ivins First Amendment Award Feb. 23 at 6 p.m. in the Gibbs Education Center, lower level of the Katy and E. Don Walker Education Center, 19thStreet. Tickets are $50 adults/$25 students including a dinner and silent auction. Tickets may be reserved at https://www.walkercountydemocrats.org/buy-molly-ivins-tickets-here.html.Corchado is being honored for his courageous reporting in the face of death threats and other intimidation. Thoreau Woods Unitarian Universalist Church is sponsoring a free, public talk by Corchado at 10:30 a.m. Sunday, Feb. 24 at 1400 East Mosley Lane with a potluck lunch to follow. All are welcome. This is a unique chance to hear from an outstanding journalist on the front lines of the constantly breaking news story the border and immigration. The following story shares some of Corchado’s background and accomplishments. Alfredo Corchado, Mexico Bureau Chief for the Dallas Morning News, had many sources as worked his way through stories on the dark underbelly of the Mexican drug cartels and the grip of terror they were using the choke the life out of Mexico. He had followed leads into the desert and to the bodies of murdered girls; he followed the disappearance of young men; he followed the endless kidnappings; he followed the corrupt politicians and the ones who seemed to hope against hope not to be corrupt. Dante was a lawyer, and his clients included the cartels. He and Corchado met quietly, from prying eyes. The last time Corchado talked to him was when Dante called to set up a meeting near a bridge crossing from Mexico into the US. Dante didn’t show. Days later Corchado heard a report that gunman in a Ford Expedition, had gunned Dante down in Juarez, with a 9-millimeter and an AK-47. Surveillance cameras on the road just happened to be out of service. But, Corchado kept asking questions, just as he had been doing for years in an effort to somehow save his native country by sharing its stories in his new one, no matter how awful some of those stories might have been. When Corchado started out life in Mexico, surrounded by family in a small Mexican village, there was little to indicate he would become one of the foremost, and courageous, journalists of his time. He was just another small Mexican boy caught up in the continental drift from Mexico to the United States, swept along by parents on a journey into hope. From Mexico he went, legally, to California where he worked in the fields alongside adults. He dropped out of school. He sat on boxes at the edge of the field with a white Vietnam veteran who told him to follow his dreams, that the “world needs your optimism.” The family left the fields and ended up in El Paso where Alfredo’s mother opened what would become an iconic El Paso diner named for her son – Freddy’s. The more he read, the more he looked at his native country and his adopted one, the more the urge to tell stories, to shine lights, grew. He went to the University of Texas at El Paso. He started at the local paper, digging into life along the border. To his surprise the Wall Street Journal called one day and he ended up as in the strange and cold city of Philadelphia. It was to be his base for follow the great Mexican migration around the country. Alfredo Corchado will be in Huntsville Feb. 243to receive the Walker County Democrat Club’s Molly Ivins First Amendment award. He also will speak at Thoreau Woods Unitarian universalist Church Sunday,Feb. 24 at 10:30. That speech is free to the public. But the border kept pulling him back. The corruption of his homeland’s government, the evil and oppressive terrorism of the cartels, broke his heart. So he did what journalists do. He asked questions, questions that hurt and angered and led him often to lead a life in hiding. And he wrote stories. The ground-breaking stories revealed for the first time the depth of the horror brought on two lands by the cartels, a horror fueled in no small part by the US drug habit. After his reporting he wrote his first book “Midnight in Mexico – A Reporter’s Journey Through a Country’s Descent into Darkness.” The book documented both the impact of the cartels and the risks that befall anyone – even a journalist now with American citizenship – who report on them. His second book took a different turn. 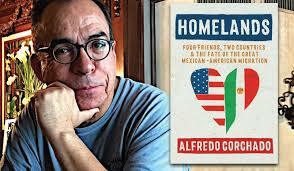 “Homelands – Four Friends, Two Countries, and the Fate of the Great Mexican-American Migration.” Corchado uses three friends he made when he came to Philadelphia to track the hopes, dreams, anxieties and stressed of men trying to adapt to being citizens of one country while being tied being severing with where they came from. The book tells a story of migration in personal, often painful terms, a story most white Americans have heard or ever will hear short of reading the book. “I see myself as a journalist and a story teller who shares stories about who we are: immigrants who have built this country as Germans, Irish, Hungarians, Italians, Mexicans and many others,” Corchado has said of his work. His reporting and books have led to several awards and honors, the local Democrats Molly Ivins Award being the latest. The Ivins award is given each year to a journalist or organization that has best lived up to the responsibilities of the First Amendment and helped keep alive the spirt of the late Molly Ivins, an iconic Texas journalist who died several years ago of breast cancer. He has received multiple honors including: the 2007 the Maria Moors Cabot award from the School of Journalism at Columbia University in 2007, which cited his “extraordinary bravery and enterprise;” Elijah Parish Lovejoy Award presented by Colby College for coverage of the border; induction into the Texas Institute of Letters in 2018, and is also a former director of the Borderlands Program at the Walter Cronkite School of Journalism at Arizona State University; was named as part of the 2014 International Latino Book Awards Finalists. Rich Heiland, former publisher of the Huntsville Item and owner of Free Press publications, LLC, a reporting/writing firm working with media, has been a reporter, editor and publisher at several daily papers. He was part of a Pulitzer Prize winning team. He taught journalism at Western Illinois University. He was the first recipient of the Molly Ivins First Amendment Award. He can be reached freepresstx@gmail.com or 936-293-0293.